HMH Books for Young Readers, 9780618862542, 32pp. to see a grace of unicorns is to witness a marvel. In this book, you will also find . 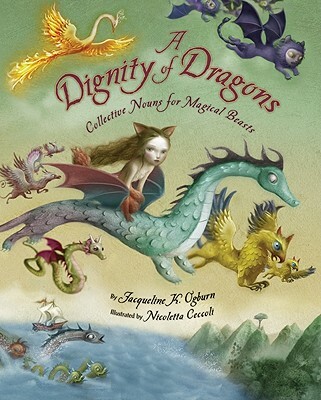 . .
With inventive groupings, luminous artwork, and a fact-filled glossary, A Dignity of Dragons makes for a bestiary to treasure. For within its pages, you’ll learn about all the creatures you may be lucky enough to see, if you know where to look. Jacqueline K. Ogburn worked as an editor at New York publishing houses for a decade before moving to a new home in North Carolina, raising her children, and beginning a second career as a children's book author. Nicoletta lives and works in San Marino, Italy. Awarded with the Andersen prize, "baia delle favole" as best Italian illustrator of the year in 2001, Nicoletta has also received the silver medal from the Society of Illustrators of New York.